Regional Information Center "CARPATHIANS" » VOLCANO NECK. 18′ 17′ 40″ N lat; 22°59′ 12″ E long. At the northern outskirt of Siltse village it is located andesite quarry up to 50 m deep. 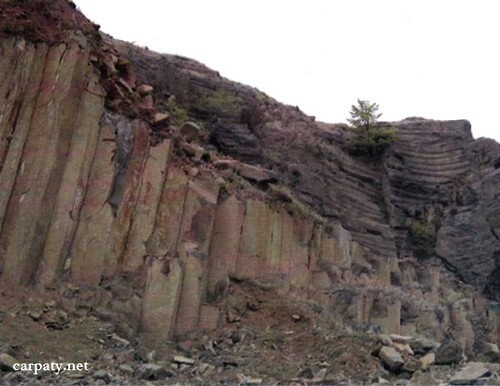 It is discovered by quarry the upper portion of volcanic neck composed of Late Sarmatian (absolute age about 11.0 Ma) diorite porphyries with columnar jointing. 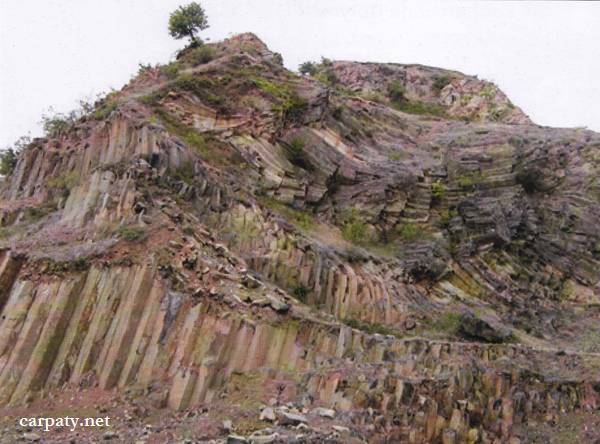 Deviations of the columnar jointing reflect direction of magma ascent by volcanic channel of irregular shape. Lava flows which were emplaced from this neck are completely destroyed throughout around the neck by late erosion processes. They are preserved only in 1.5-2.0 km eastward on the slopes of the Khat ridge. Outcrop is one of the best in Mukachivska depression where one can study neck facies of Late Sarmatian andesite volcanics. Ecological conditions are suitable. Accessible by motor-car 0.6 km to north-west from the church in Siltse village. It is suggested to give the status of geological state-rank land mark.